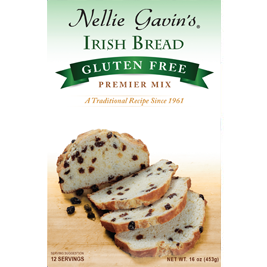 Irish Bread Gluten-Free Mix - Nellie Gavin's Inc.
Our traditional Irish Bread mix is now available Gluten-Free, providing a light, moist bread. This Easy 1-2-3 Bread Mix is made with gluten-free rice and potato flour and raisins. Pairs perfectly with your favorite butter or jam. Made with Real, All Natural Ingredients.